In America, we run on the notion that 15 minutes before something is scheduled is on time, arriving exactly at the scheduled time is late and arriving late is unacceptable. In Africa, it’s literally the opposite. Fifteen minutes after something is supposed to start is early, 30 minutes is on time, and so on. My first experience with African Time was during PST when my host sister and I went to her cousin’s beauty pageant. We traveled there by public taxi, which meant we had to leave the pageant by at least 4:30 p.m. to catch a ride back home. The beauty pageant was supposed to start at 11:00 a.m. and we were an hour late. Not that it even mattered we were late, because the pageant didn’t actually start until 3:30 p.m. and lasted until 6:30 p.m. My host sister struggled to find us a ride home, and thankfully, she did at the last minute. Mind you, this was the night before my swearing-in ceremony. Her mama instincts stepped in, but gogo wasn’t too happy. From then on, I knew there was no turning back: My time-oriented life from the previous year – where I had to be at work exactly at 7:00 a.m. or face discipline – was long gone. 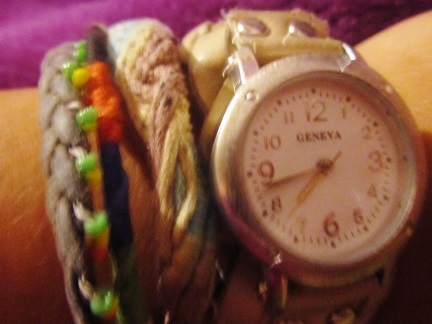 I didn’t wear a watch in America, but my watch means the world to me here. I don’t know how I’d survive without it because we don’t have clocks in our classrooms at school. Nope, not because we don’t have the money. It’s just simply because time management doesn’t mean much to South Africans. “So, when’s the event start?” I asked my counterpart Miss Molefe. Now, I don’t think African Time is “pretty cool” when it interferes with the way our school runs, but the only thing I can do about it is make sure I’m in my class on time. Although, my Monday and Tuesday 8 a.m. English class usually starts at 8:15 a.m. due to various circumstances at morning assembly or in the staff room. That’s a battle I decided not to pick – even if I herded my learners to class on time they would still be fidgety and too much to handle without downing my daily two cups of coffee. No thanks. Look at me here – I’ve got 18 months left in my service, and I’ve already researched my graduate school possibilities. I’ve started to make a plan for when I return to the States in more than a year and already know where I might move to. As an American, I must always have the future in mind. Currently, term one is coming to a close and teachers (including myself) are cramming to throw in end-of-the-term assignments for our learner’s final grades. I’m sinking with the other teachers trying to get everything done, so what happened to that American girl that likes to plan ahead? Oh yeah, I’ve been working with South Africans for eight months and African Time has sucked me into its warp at school. Everything I multi-task has become a blur and gets done when I finally get to it. I can be very-American-like when it comes to planning things about America like graduate school, but when it comes to anything that has to do with South Africans I tend to put it off. Does this mean I’m integrating?! Maybe. Or maybe I’m just becoming Last Minute Lizzie – a persona I played very well in college. I know well enough that no planned activity will start on time according to schedule. But for some reason, I still pick my American mind and get ready on time or arrive on time. I’m secretly hoping that this time, maybe this one time, something will start on time. 1:30 p.m., no teachers have arrived. 1:40 p.m., teachers start to arrive. 2:00 p.m., all the teachers finally arrive. “Why are you late? I need you to tell me why you are late. Is there a reason?” – my principal, trying to fight African Time. “Siyaxolisa (we are sorry)” – the teachers, with no excuse. Yup. This Is Africa (TIA).